and Parks Canada, our Street View cars, trikes and Trekker mapped more than 44 locations with beautiful, 360 degree panoramas. Leave your gear behind and still get a chance to marvel at the Sequoias in California. Or perhaps you’re looking for more adventure? Lookout to Signal Mountain in Wyoming’s Grand Tetons, climb around California’s Joshua Tree National Park, or dip your toe into Moraine Lake in Banff, Canada. Getting tired? 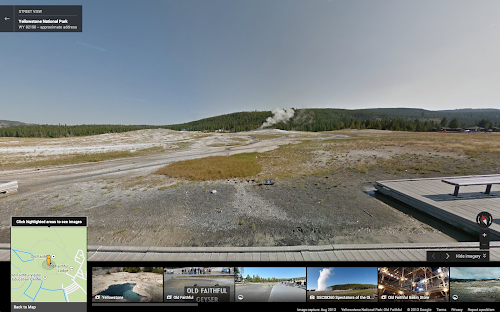 Take a break to watch the Old Faithful geyser in Yellowstone National Park, the first national park in the world. Or, let your inner history buff come out to explore monuments and fortresses across North America. Brush up presidential facts as you check out the Lincoln Memorial or get a closer look at US presidents at Mount Rushmore. Take a moment to “Remember the Alamo” as you visit this battlefield in Texas or step inside the Halifax Citadel to investigate the city’s role as a key naval station in the British Empire. For a selection of our favorites, check out the Views collection. 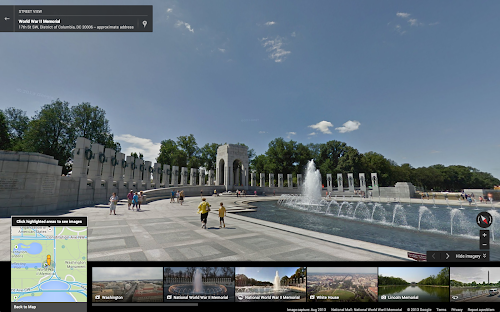 Fifty-six pillars and a pair of small triumphal arches surrounding a plaza and fountain make up the humbling World War II Memorial in Washington, D.C.
Take a moment to remember those that served at the Korean War Memorial, Vietnam Veterans Memorial and National World War II Memorial in Washington, D.C. Whether you’re planning your next adventure or just looking to be inspired by the beauty of the world from the comfort of your living room, we invite you to head over to Google Maps and let Pegman be your virtual guide to Street View. We hope you enjoy exploring the majestic scenery of North America’s national parks and monuments. What do tents and hiking boots have in common? You don’t need either to start exploring or planning your next adventure to some of the best national parks and historical sites across North America. 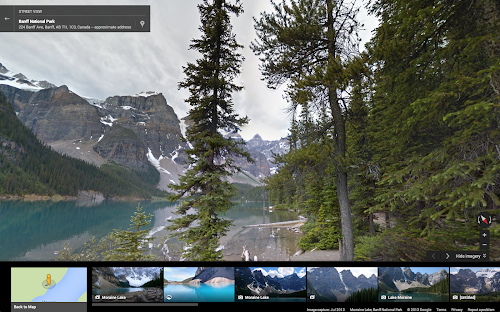 Working with the U.S. National Park Service and Parks Canada, our Street View cars, trikes and Trekker mapped more than 44 locations with beautiful, 360 degree panoramas.